Stade de la Route de Lorient Anglicised to Lorient Road stadium is the home of Rennais F.C who are based in Brittany, Northwestern France. First open in 1912, the ground was rebuilt in 2001 with room for a shade under 30,000 football spectators and receives strong local support. Stade Rennais FC home has incredibly been Stade de la Route Lorient for over a century, with the stadium officially opening in 1912. The previous stadium was situated on the bank of the river Vilaine and despite Rennais implementing a drainage system in, the pitch was regularly prone to flooding in the Winter which disrupted the fixture schedule forcing the club to find a new permanent residence. The new Stade de la Route Lorient was situated on the Western bank of the river on higher ground and the inaugural match was played on the 15th September 1912 against local side SA School of Rennes. The home side christened the new stadium with a 6-1 win, but some regard the game against Racing Club de France a month later as the official opening. Upgrades and refurbishments to the Route Lorient Stadium were inevitable, and the facilities at the ground today, greatly differ from the facilities at the turn of the 20th century. Attendances for football matches in France rocketed after World War 2, and the number of fans seeking entry to the stadium more than doubled in a period of 20 years leading to expansion. Two cup wins in 1965 and 1971 led the club to contemplate further expansions, but the average attendance dropped from around 12,000 to 4,000 over the next twenty years as the club failed to consolidate their position in the top flight of French Football. It wasn’t until the mid 1990s that the club felt confident enough to launch €40 million euros worth of modernisation. The work was started in 1999 and completed five years later in the summer of 2004 where 28,525 fans attended the inaugural friendly match between France and Bosnia. Route de Lorient is comprised of four stands: Tribune Super U (Nord), Tribune Ville De Rennes (Est), Tribune Credit Mutuel de Bretagne (Sud) and Tribune France (Ouest). 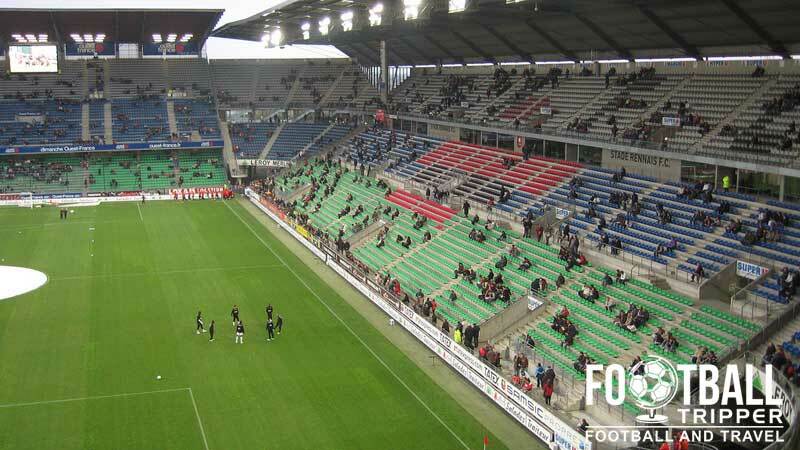 Away fans are housed within the south-east corner between Tribune Ville de Rennes which is the eastern goal-end and Tribune de Bretagne which is the grandstand to the south. Although situated out of town, Stade Rennais’ stadium is still located within the confines of the central ring road, meaning that there are quite a few restaurants, cafes and bars nearby, although the map below identifies the majority of them being in the centre ville. South of the Route De Lorient you have Flunch (Fast Lunch) which is a popular chain of restaurants/ similar to Sizzler in America, as well as a McDonalds and similarly ever present Subway, which is slightly to the east. Back towards Rennes city centre you will encounter many more “proper” and traditionally French restaurants, as well bakeries which sell local specialities of Brittany such as Pancakes (Crêpes) and the Pancake-Sausage roll. Stade Rennais operate a 300m² store at Stade de la Route de Lorient, situated in the Super U Tribune stand to the north in addition to an official online store. Tuesday to Saturday from 10.00 am to 7.00 pm. Sunday: 2.00 pm to 7.00 pm . Matchdays before and after match. The club shop is embedded within the Route de Lorient. 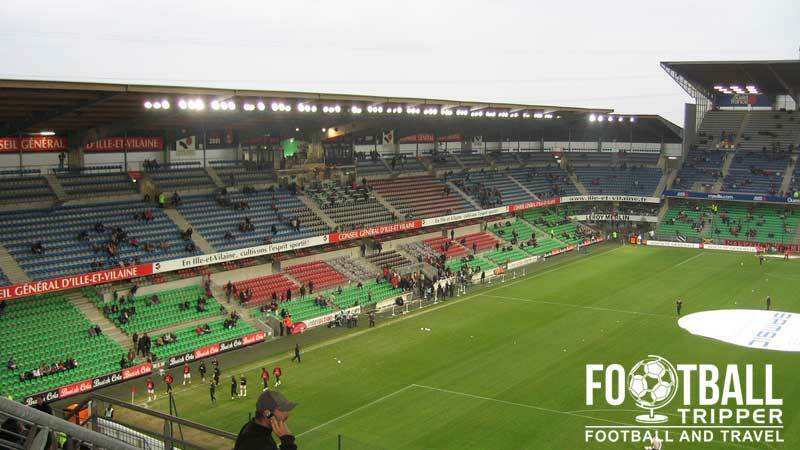 Stade Rennais do not currently offer a stadium tour of Route de Lorient, and I wouldn’t expect this to change in the future unless they move to a new ground. Although renovations occurred between 1999-2004, it still hasn’t sufficiently modernised the facilities to make them worth showing off via a guided tour! 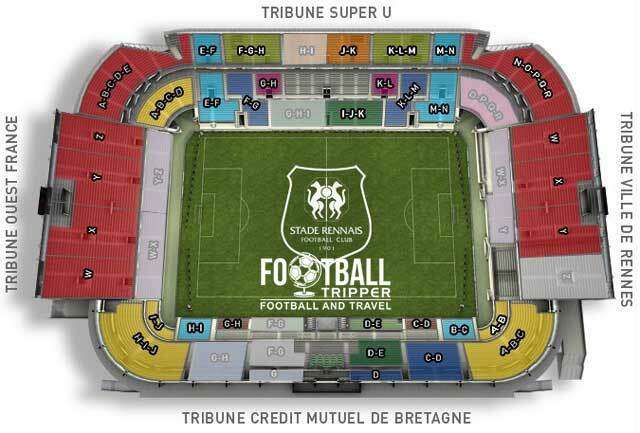 Tickets to see Stade Rennais can be purchased online, at the stadium (either ticket booths or official club shop) or through other ticket vendors such as Francenet and Ticketnet. As Rennes rarely have a full attendance at home, you can often rock up to the stadium on the day of the match and acquire tickets, but there is of course no guarantee. 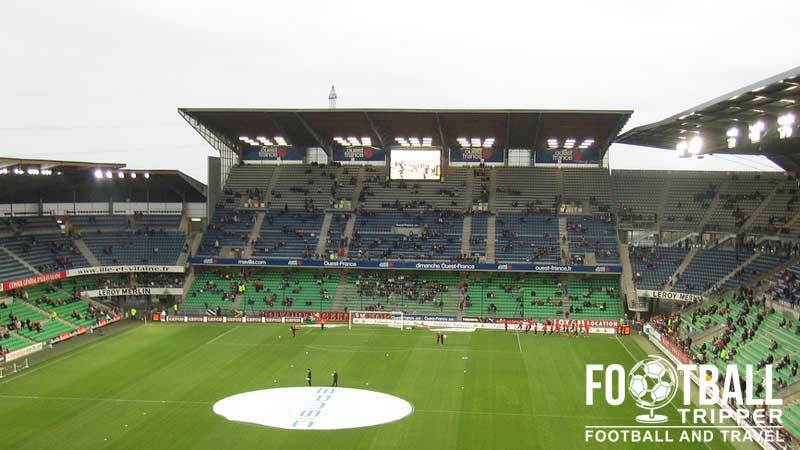 Price wise tickets tend to start at just under €10.00 for a seat behind the goal, and anywhere up to €40.00 for a central seat in the main stand, although prices increase by €5 – 20.00 when Les Rouges et Noirs host the bigger teams in Ligue 1. Stade de la Route de Lorient is located West of the city of Rennes on the Northern Bank of the Vilaine river, approximately 3.2 km from the Centre ville. A nice leafy view of Stade de la Route Lorient. The local infrastructur is managed by the department of public transport in Greater Rennes (Star) and there is plenty of cheap travel options. Look for Exit 10 signposted as Port de Lorient and turn towards the city, following the river. The ground will be on your right hand side. 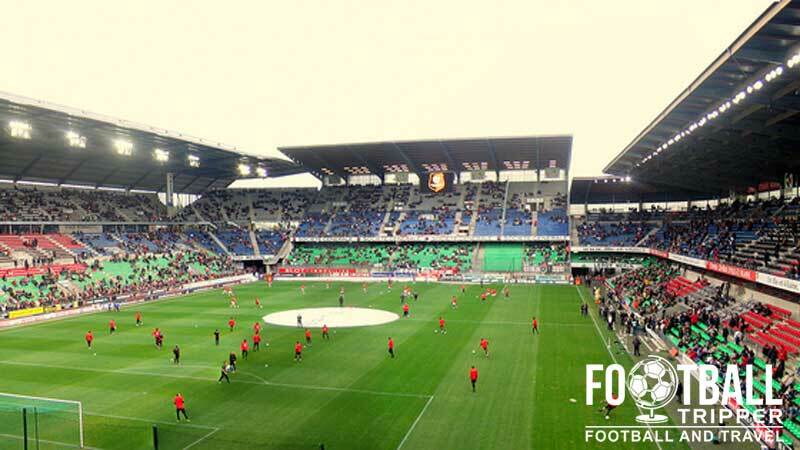 Check out Stade Rennais – Parkopedia for the most up to date car-parks. Currently there are two fairly large ones south-west of the river, less than 100 metres past the river. The main station of Rennes Gare de Rennes, is approximately 4 km East of the Stadium and sits opposite the river and Cathedrale Saint-Pierre de Rennes on the map. Well connected to the rest of France, visitors can easily travel from across France with Paris only 2 hours away, Le Mans 1 hour and Lyon/Lille just under 4 hours. Currently there is one subway line (A) in operation which was built in 2002 and connects J.F Kennedy (Northwest) to La Poterie (Southeast) with a second line (B) planned for a 2018 completion date. Unfortunately none of the stops really assist football fans on the journey to Stade Rennais FC, which means you’re better of getting the bus or walking. From Place de la République which is regarded as the city centre or the main railway station you can catch Bus 11 in the direction of Z.I Ouest which will take you up to the stadium with a an official Stade Rennais stop. Within buses departing every 15 minutes or so and a journey time of 10 minutes, the bus is probably the best option for those going to the football. Rennes-Saint Jacques airport is located 8 km Southwest of the city centre and is served by a number of flight carriers such as Air France and Flybe offering flights to numerous international destinations. Although not the largest in terms of Passenger numbers (481,271), it is the 7th largest in France based on the volume of freight handled (12,094 tonnes). The three closest hotels to the stadium are Lorient Hotel, La Voltaire and Campanile Rennes Cleunay which is located just off the ring road. Heading back towards the city centre, there is an abundance of choice such as Mercure Rennes Centre Parlement, Hotel Mercure or Hotel Ibis Rennes Centre Gare Sud which is arguably the closest to the station.